Easter is sneaking up on us quickly and I wanted to share some idea for celebrating Easter with toddlers this week. We love to dye eggs, read Easter books, go on egg hunts, get our daughter's picture taken with the bunny, dress in pastels, eat yummy treats, make decorations and go to church to celebrate. I'm going to go pretty low key on our decorations because A. we're going to be moving soon and B. we're going to be having a baby soon. I'm going to pull out just a few of my favorite decorations that will work for Spring and that I can leave up past Easter - bunnies, spring flowers, pastel decor, etc. *I'd like to add in a wooden puzzle or a letter toy to complete her basket. 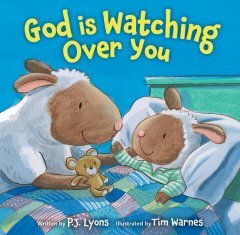 We're adding Yummy Yucky by her favorite author, hide and seek Pout Pout fish since it's been such a favorite, and God's Watching Over You by PJ Lyons. It's a sweet book that takes you through a variety of situations that kids are familiar with - play dates, going to the park, bath time, bed time - and reminds kids that in all situations God is watching over them. The line is repeated over and over and is easy for kids to memorize and repeat. It's a durable board book that I think will easily become a favorite at our house. I love the reminder on every page - God is watching over you! *I was gifted this book in exchange for an honest review of it. Here are our favorite Easter/bunny books in case you're in the market for some new ones. I love to pick up season books at TJ Maxx or on Amazon and I really love when people gift Olive books for the holidays. She's got a cute collection that I pull out every Spring and we have a dedicated bookshelf just for her seasonal books. It seems like she really enjoys finding new books on her shelf each month. I won't be decorating a mantle this year, but this was my mantle from last year. I LOVED it and am so excited to decorate the mantle in our new house for every holiday. What fun things do you have planned for your family this Easter season?? Any special traditions you can't live without? I love this list. I got all of Olivias Easter stuff at the dollar store. $17 and her basket is full and we're stocked on candy bracelets for a year haha. I love the book! Olivia is book obsessed so I know she'd love it! Such great basket gift ideas! Chalk is a go-to in easter baskets I feel! First off- Olive is just TOO precious in that picture from last Easter! I get really into my girls and baby boy's Easter's baskets- it is one of my favorite holidays! The Easter bunny hides them on Saturday night and the kids get to find them after we get home from Mass on Easter Sunday. We also always have an Easter egg hunt in our backyard on Easter Sunday. And now that my girls are older, we pray the rosary together on Good Friday- it is such a special and precious time!! Love it all! Where is the bunny chalk from? That's on my list for my gal's basket too! Hi!! Playing catch up- I've missed chatting this week! This is on my to do list so THANKS for the great ideas!! And I'm amazon'ing hide and seek pout pout right now since L is currently all about that one! Last night I ordered Jack 3 train books to go in his basket. Last year I did the big truck as his "basket" and he still loves that thing. I would love to do something practical again. I will be limiting the candy this year and will do more spring fun items. I love those play packs they are so fun to have for on the go visits. Also the bunny puppet is just so sweet. She is going to love her stuff. Welcome to the Family Fletcher! !